Offered by Astronics' wholly-owned subsidiary Astronics Max-Viz, the 2300 can now present images on multi-function displays (MFDs), primary flight displays (PFDs), and on standalone displays. The Max-Viz 2300 is available on Sikorsky aircraft at time of purchase or as an upgrade later. 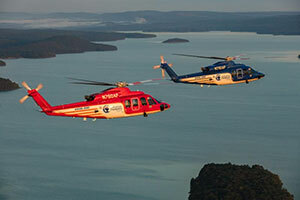 "Astronics Max-Viz is pleased to be flying on Sikorsky's S-76® platform and to be a part of its four-decade legacy of safety and reliability," says Tom Geiger, business unit manager for Astronics Max-Viz. "We are excited to be part of upgrading the capabilities of the proven S-76 fleet," he adds. Astronics Max-Viz EVS provides pilots with an unprecedented level of situational awareness and safety by enabling them to see more precisely during day or night in adverse weather conditions, such as haze, smoke, smog and light fog, even on the darkest night. At night, pilots can also see and avoid clouds for a smoother ride. While landing, pilots using the Max-Viz EVS can identify the helipad and view the terrain clearly to avoid wildlife and unlit obstructions. Of the over 3,000 installed Astronics Max-Vis EVS systems, approximately 60 percent are on fixed-wing general aviation aircraft and 40 percent are on helicopters. With supplemental type certificates in both fixed-wing and rotor-wing aircraft, Astronics Max-Viz offers products built on more than 15 years of success in enhanced vision systems. View the EVS offerings in detail at www.astronics.com/max-viz.